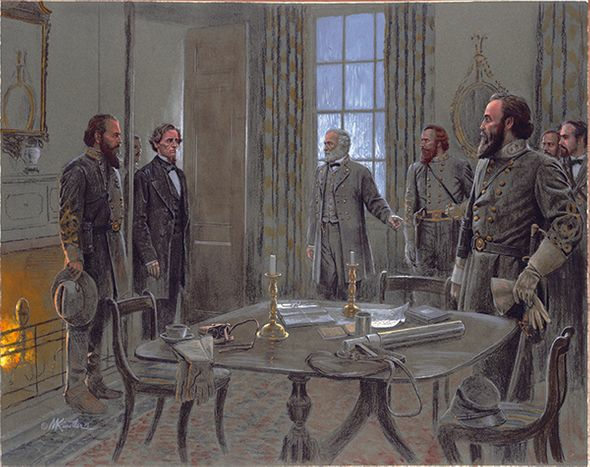 Mort Kunstler Hand Signed and Numbered Limited Edition Giclee Canvas:"President, This is Our Stonewall Jackson"
Size: 21" x 27" and 25" x 32"
Edition: Artist Signed and Numbered, Limited Edition to 100/50 with 10 Artist Proofs. COA included. 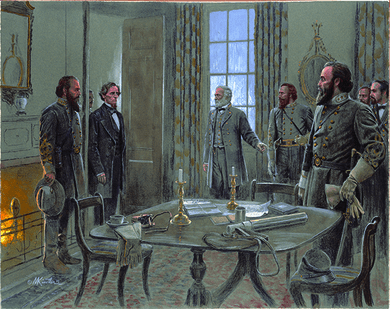 About the Art: Cordial relations never existed between Jefferson Davis and Thomas "Stonewall" Jackson. Early in the war, Davis had received reports that Jackson was a "loose canon" in the field. The president felt that the former VMI professor was an odd and unpredictable officer who needed a tight leash. Jackson openly resented some of the commander-in-chief's directives, especially during the Romney campaign. As a cold rain poured the day after the Battle of Malvern Hill, President Davis arrived unannounced at Lee's headquarters, a private home near the battlefield. The general was taken by surprise while he was conferring with his weary lieutenants. He began introducing his officers; Longstreet was standing in front of the fire, Stuart was to Lee's left, and Jackson remained back from the others. When Davis looked his way inquisitively, Jackson "stood as if a corporal on guard." Lee saw the two men staring at each other. "Why, President," Lee exclaimed, "don't you know General Jackson? This is our Stonewall Jackson." The highly sensitive Davis bowed. A staff officer watched the unemotional Jackson give "the salute of an inferior to a superior." No further exchange occurred between the two men.